This plugin will add a tab on the user community builder profile that will list their ads. Then select the zip folder containing the communitybuilder_adsmanager_plugin and click Upload File & Install. In the AdsManager Configuration, you can see a 'Third Party' tab, this tab contain a dropbox which allow you to choose the behavior of the user profile in the ads. Profile: Redirects you to your CB profile when you click the 'My Profile' link in the AdsManager menu. My Ads: Redirects the users to your CB profile when they click on your username in an ad. Note : This feature doesn't work if JomSocial and Community Builder are both installed on your website. When you create or edit a field, you can prefill it with the value of a CB field. 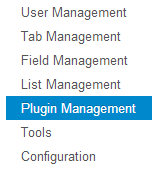 You just have to select which field will be used to prefill the AdsManager field. Note : You can also choose a CB field to fill a dropbox.